Your Grey Warden won't be making a return in Dragon Age 2, but that doesn't mean that the decisions you made won't matter. BioWare hasn't made a huge number of sequels, but when it does make one, it likes to give players the option to import their character from the first game, and have their decisions help shape the new adventure. Dragon Age 2 is a little more challenging however, as you're not playing the same character as you were in the first game. But that hasn't stopped BioWare, and even though your Grey Warden is off doing something else, like advising a king or being dead, the choices you made will still influence the world of Dragon Age 2. BioWare's Mike Laidlaw explained that players would be able to import the world they shaped in the first Dragon Age into the second, so who they supported in Orzammar or who was on the throne in Ferelden would make a big difference to how the game played. Laidlaw added that BioWare didn't consider the Dragon Age series to be about any single character, but at the same time wanted players to feel like their decisions were important. Honestly, this isn't much different than what BioWare did with Mass Effect 2. For better or worse, all your decisions are still going to come back and bite you in the behind, except that this time it won't be your character's fault. Obviously, we're going to miss out on role-playing opportunities as NPCs recognize us and maybe even blame us for things, but we're still going to see our handiwork everywhere we go. 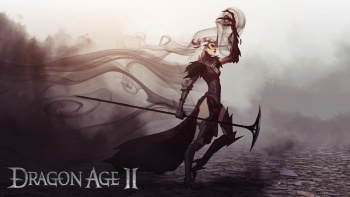 Dragon Age 2 is due to be released for PC, PS3 and Xbox 360 on March 8th in North America and March 11th in Europe.